LAS VEGAS, Nev. - It was a historic night at Earl E. Wilson Stadium as the No. 1 seeded New Mexico Lobos defeated the No. 3 seed San Diego State Aztecs, 22-3, to officially win the 2012 Mountain West Baseball Championship and earn the league's automatic bid to next week's NCAA Tournament. The Lobos broke several championship game records en route to securing their second consecutive Mountain West tournament crown. UNM's 22 runs scored were the most ever in a Mountain West championship game, shattering the old mark of 15 set by TCU in 2008. The Lobos also set new standards for RBI in a championship game (14), hits in a championship game (22), home runs in a championship game (3), and doubles in a Mountain West tournament game (7). Individually, UNM's Alex Real set a new record for RBI in a championship game with seven. New Mexico received contributions from up and down their lineup on Saturday, pounding out 22 hits as a team. Six players had at least three knocks including second baseman Kyle Stiner who finished with four. Centerfielder Josh Melendez, who was named tournament MVP at the conclusion of the night, went 3-for-6 with two RBI and two runs scored. The Lobos got on the board early and often Saturday, plating six runs in the first, four in the fourth and four in the third. Then, with the score 15-3 in the fifth, New Mexico broke open the floodgates. UNM scored seven runs in the frame on seven hits, including a two-RBI single by Trey Porras. Both teams went scoreless from that point forward, but the Lobos had already done all they needed to do, winning by a final score of 22-3. The win went to New Mexico starter Josh Walker (8-2). The sophomore right-hander allowed three runs, one earned, in seven innings of work. Aztec starter Ethan Miller (3-2) was handed the loss after allowing six runs, three earned, in just two-thirds of an inning. At the conclusion of the game, the Mountain West announced its All-Tournament team for the week. 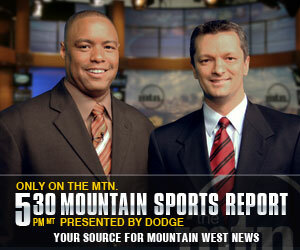 Mountain West teams will find out 2012 NCAA Tournament destinations on Monday, May 28 at 10 a.m. MT on ESPNU.